Up to 20,000 tickets to see Pope Francis at the biggest public events during his two-day visit in Philadelphia will go up today, Sept. 9, on the website of the World Meeting of Families. All the tickets are free and are available on a first-come, first-served basis, with a limit of four per person. The block of 10,000 tickets for the Sept. 26 Festival of Families went up at 4 p.m. today, and by 4:02, all the tickets had been taken. Another set of 10,000 tickets for the Sept. 27 papal Mass goes up on worldmeeting2015.org/tickets at 8 p.m. tonight. Within minutes yesterday, 10,000 tickets for the Saturday afternoon address by the pope at Independence Hall were snatched up by some of the more than 394,000 visitors to the World Meeting website. But since 30,000 people are expected for the address, which will be preceded by a concert of eight culturally diverse music and dance groups, plenty of space for unticketed visitors remains on the grassy Independence Mall area for the event. The same is true for Saturday’s and Sunday’s public events on the Benjamin Franklin Parkway. People without the good fortune to snag a ticket will still have access to events. 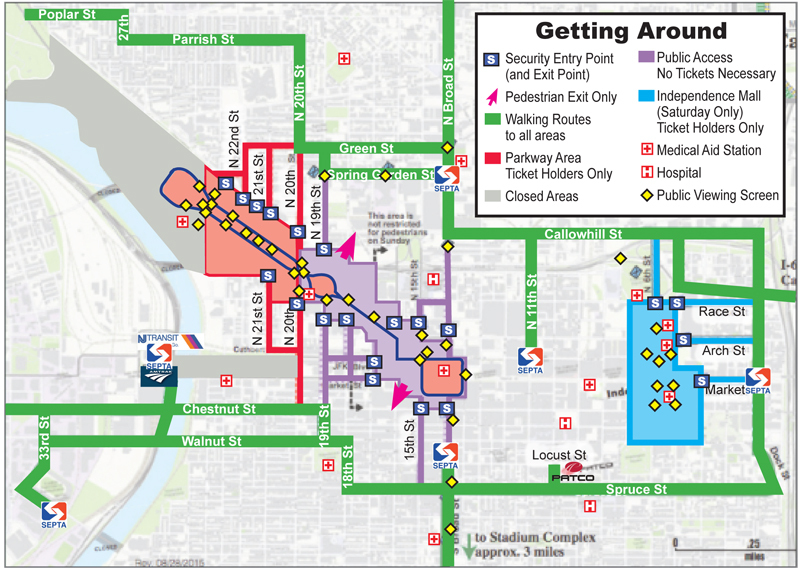 The ticketed areas extend west of 20th Street along the parkway to Eakins Oval, at the foot of the Philadelphia Museum of Art. Participants at 20th, 19th, 18th and eastward will join the throngs on the parkway with a straight line of sight to the stage area. And almost everyone east of 22nd Street will watch the events on some of the 31 large Jumbotron screens along the parkway. The motorcade of Pope Francis will also bring most people, ticketed and not, within close view of the pontiff. Sometime after the 5 p.m. start of the Festival of Families on Sept. 26, Pope Francis will travel in his popemobile from the Art Museum down one side of the parkway, around City Hall and up the other side of the parkway back to the museum and Eakins Oval. He is expected to arrive at the stage around 7:30 p.m. to join the concert featuring the Philadelphia Orchestra, Andrea Bocelli, Latin music star Juanes and to hear testimonies by six families from around the world. He will also deliver remarks at the event. On Sunday prior to the start of the 4 p.m. Mass, Pope Francis will again review the crowd by popemobile but on a shorter route. The public events and private stops by the pope — including his visit to St. Charles Borromeo Seminary, his address to bishops there and his visit with prisoners and their families at Curran Fromhold Correctional Facility — will be televised on all 40 Jumbotrons, including screens in the Independence Mall area. They will be located in the broad swath of center city designated the Francis Festival grounds, where once cleared through a security checkpoint, people can roam the area freely.